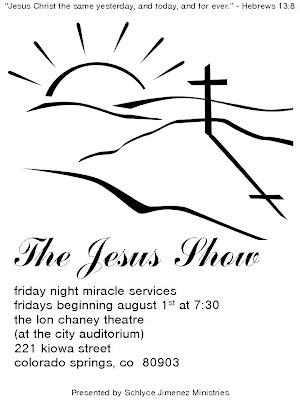 Here's the new flyer for our Friday night miracles services, called "The Jesus Show", that are scheduled to begin on August 1st. As you may know we began a Healing Boot Camp on June 16th this month to train the healing teams that will be ministering in these meetings. The miracles have already begun pouring in from the Boot Camp - healed pigeon toes, severe food allergies gone, arthritis healed, locked jaws opened and many more. We are expecting a mighty city wide move of God here in Colorado Springs as we make room for Jesus to demonstrate that He has risen and is alive!